You know, when the networks tweak the end times of shows to try to keep you from watching the competition. 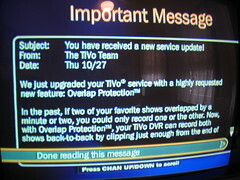 For DVR owners, the practice chops off recordings (called TiVo-b0rking) and makes it impossible to record back-to-back shows on different networks. As more people gear up with DVRs, the networks will face increasing pressure to knock off the silly stunt.